Facebook has changed the ways that we communicate with one another. Perhaps the improvements in hardware, handheld mostly, has given platforms like Facebook/Messenger, Instagram and WhatsApp the ability to grow sharply. If the front and very important back cameras and delivery mechanism to the internet (Wifi and LTE - 5G nearing) did not exist, we wouldn't be able to share our thoughts, pictures and experiences immediately. It must be far harder to make important decisions as a teen and in the early stages of adulthood when there are all these platforms around. At the same time, it has never been easier to stay in touch with one another than at any other stage in humanity. The ancient Persians are attributed with having the first reliable postal system, the Indians and Chinese too. The Romans, like many things of that era, perfected the system to a degree not seen, around 2000 years ago. Modern mail, like our grandparents became used to, was as a result of modern transportation strides by humanity. Remember the very lightweight "airmail" letters when sending overseas? One page that you could seal to have one and a half pages of writing ..... Ha ha, those were the days my friends of lightweight blue paper. Mail volumes have steadily declined over the last decade, email and social media platforms make it far easier to communicate. Thanks to Facebook, and the wonders of handheld devices, network infrastructure and the like, you can call (via WhatsApp and not "wifi" calling) anyone, anywhere in the world at almost any moment. So there. OK, Facebook numbers quickly. The Facebook platform is nearing two billion monthly users, currently 1.94 billions, which represents a little over one-quarter of all the folks on the planet. I guess at some level there will have to be a subscriber ceiling. Owing to the age thing (one has to be a certain age to get an account) and the fact that internet penetration around the world isn't 100 percent (and is unlikely to be any time soon), I suspect we may see a levelling soon. The other platforms are big, in fact huge. Messenger has 1.2 billion monthly users. Equally, Facebook businesses is used by 70 million living and breathing companies across the globe. That is a LOT. Instagram crossed 700 million users in the last few months. 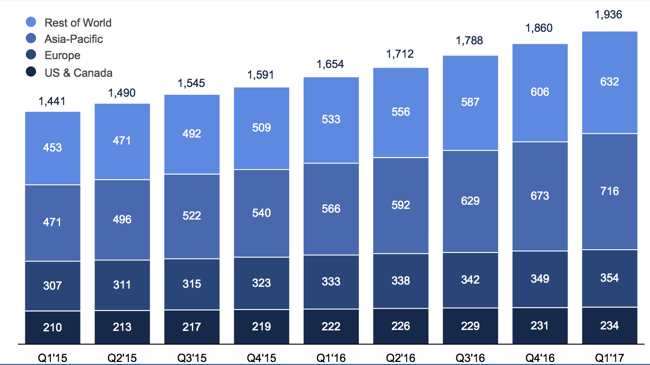 Instagram revenues are included within Facebook revenues, they don't break those out. How did those ads impact your user experience? Not at all ...... WhatsApp is 8 years old in February, they have 1.2 billion users. These are all big numbers, obviously many of them are overlaps, I use all four. Revenues for the first quarter of their 2017 financial year topped 8 billion Dollars, that represents nearly 50 percent growth from this time last year. 85 percent of revenues were derived from mobile. Remember the anxiety when they (Facebook) were going to struggle to monetise mobile? WRONG! Cash on hand is 32.3 billion Dollars, which represents around 7.3 percent of the market cap. Markedly lower than their "peers" (of which there are none, really). Diluted earnings per share clocked 1.04 cents (a 73 percent growth on the corresponding quarter), meaning that the rolling 12 month multiple is 43 times earnings. And the PEG ratio, the price to earnings ratio relative to the growth rates forward is around 1. Which actually means that the stock is cheap by that metric. The trick will be to keep all the irons in the fire at top heat, bashing out the multiple platforms present and future (VR is still going to be big, the hardware needs to catch up). Capex is likely to be around 7.5 billion Dollars at the top end of the range, a 50 percent increase over last year. The headcount is 38 percent higher than this time last year, Facebook now employs 18,800 people. From a dorm room in 2004 to a big employer, that is something astonishing. A few things are starting to happen here, one, the share price is growing into the company delivering astonishing earnings. Costs are likely to pick up as the user base and product widens. The key will be cost control, that will undoubtably come in the next half a decade or so. Revenues are likely to expand off a higher and higher base, I suspect people will hardly notice the changes in their streams (WhatsApp and Messenger) which will see adverts and relevant content displayed. We continue to recommend what is an entertainment business with many different avenues. A little steam has gone out of the stock, post these results, use it as an opportunity to buy on weakness.